Baerclaw Productions Video blog series – Creating the perfect video campaign. Part 2: Finding the right video production partner for your video campaign. If you watched part one of our video blog series – understanding the why before starting a video campaign, you’re ready for step two and that’s finding the right video production partner. Now I’m a little biased, I would tell you my company, Baerclaw Productions, is the team that you should work with but we’re not the right fit for every project and every client. That’s ok, there are lots of great companies out there and they all bring something different to the table. My company has been in business since 1997 and we’ve produced every type of video you can imagine, we even did a wedding… it was mine. We’ll never do another one. It’s a long story, if you want to hear why, give me a call and I’ll explain. If you’re not looking for a wedding videographer, we should talk. You should also talk to other production companies, take a look at their videos and see who their clients are. Ask for referrals from people you know and ask for references from the production company. Most importantly, have a face to face meeting with the owner or executive producer to make sure you connect and can work together. The key here is to make sure that you are comfortable with the production company before you get too far into the process. In the end, it’s your money, it’s your choice… and it’s your company – take the time to find the right video production company to make sure your video campaign works for your business. At Baerclaw Productions, we are YOUR RESOURCE FOR ALL THINGS VIDEO. Call us today and let’s see if we’re a good fit to be your video production partner. To view part 2 of this video blog series on our YouTube channel, please click here. Previous Previous post: Baerclaw Productions Video blog series – Creating the perfect video campaign. Part 1: Understand the why before starting a video campaign. 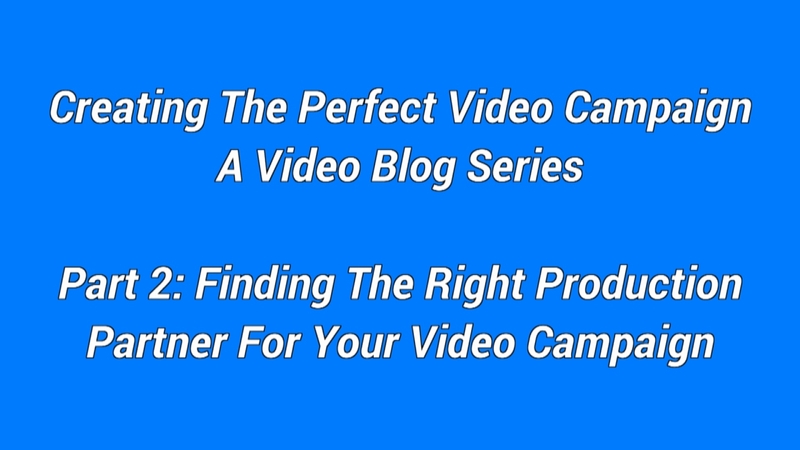 Next Next post: Baerclaw Productions Video blog series – Creating the perfect video campaign. Part 3: Let the video campaign collaboration begin.